The events of the last 9 months have made me not only thankful to see it end but needing to get on my knees to Thank God for many things. This school year began with Hurricane Harvey hitting our area and ended with the devastating school shooting at nearby Santa Fe High School. In the middle of the crisis around us there were so many beautiful things, events and people that touched and changed our community and family for the better. Let's just start with the teachers and administrators who have interacted with my kids this year... A special social studies teacher that made a fast friend out of my geography obsessed daughter, an ELA teacher who slowly won my oldest daughter over with her love of the written word, a soccer trainer who pushed my son harder than he thought he could handle, and then helped him recognize how that hard work paid off. What about a school nurse who repeatedly gave my child reassurance when she felt her anxiety getting the best of her, or the teacher who spent many extra hours creating clubs at school for kids to come together in a shared excitement over Harry Potter, K-Pop, or Creative Writing? I cannot forget the choir instructors, several of them, who provided opportunities for my girls to develop their skills in singing, but also encouraged them to truly use their gift to entertain and inspire others. That's just small taste of the special people who entered our lives this year. When I sit and think about our year, the list of people that supported our family, encouraged my kids to thrive, or just truly inspired us with the way they live life is nearly endless. 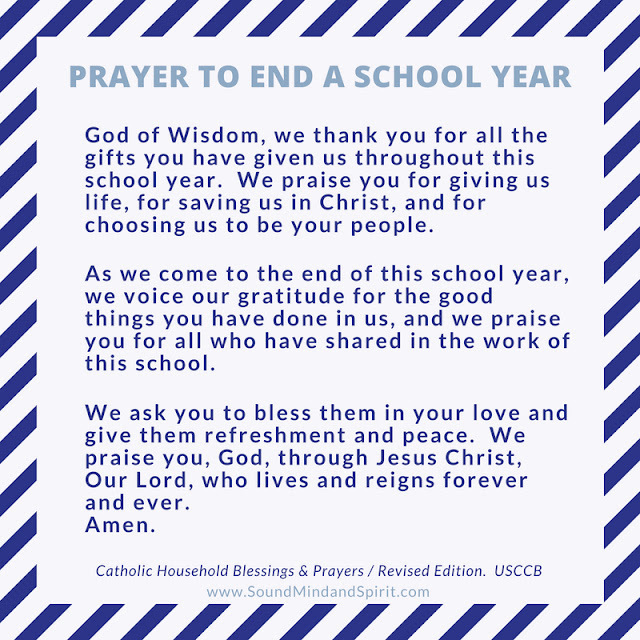 My own words to adequately describe or commemorate this 2017-2018 school year are inadequate, but I found a prayer that somehow captures what I'm feeling as my kids take their last finals of the year. This Prayer to End a School Year appears in Catholic Household Blessings and Prayers: A Companion to The Catechism of the Catholic Church. As you finish your school year, I pray God gives you the refreshment and peace you seek. The Catholic Household Blessings and Prayers: A Companion to The Catechism of the Catholic Church is my "go-to" when searching for a prayer that sums up my thoughts or a prayer in a needed situation. You can pick it up on Amazon here.